Regular readers will know that I was using a nightly drop of rosehip oil that did a wonderful job of keeping my skin plumped and hydrated through these winter months..when this finished, whilst I was very tempted to purchase a bottle of it, I knew I had a bottle of Antipodes Apostle Skin-Brightening & Tone Correcting Serum in my to use box so I opened this instead. This is my second experience of the brand, the first was the Juliet Skin-Brightening Gel Cleanser. A water-based corrective serum to help target pigmentation, brighten your skin and restore even tone. It is destined to have a leading role in your daily beauty ritual with its revolutionary bioactive ingredients from New Zealand nature. Waiwera mineral water from an ancient spring voted the world's best water* restores essential moisture to parched skin. Antioxidant-rich Vinanza Performance Plus addresses facial redness and the melanin production that can cause discoloration. Add in the subtle exfoliating action of superfruit kiwi enzyme and soothing Oxifend from red grapes, and your skin will be gloriously glowing! Mamaku black fern and Reishi mushroom assist with healthy cell renewal for the ultimate fresh-faced beauty. Apply to face, neck and decolletage morning and night. I have been using this alongside the Juliet Cleanser. The glass bottle has a dropper to dispense the serum. I am used to using clear serums but this one is the same dark brown shade of the cleanser. It has a fruity sweet scent similar and is runny in texture. This applies nicely with my skin drinking it down but it does dry feeling sticky and tight. It is a good thing that I follow with a moisturiser as I find the tightness uncomfortable. I am almost at the end of the bottle now so it is a good time to share with you a review. My skin has looked nice and bright, the dry patches have not returned so hydration wise this really works. I am feeling really happy about the overall condition of my skin and my redness is calm. There has been a very slight reduction in the obviousness of a pigmentation spot which I am pleased about. However, the issues that stop me from loving this serum are that I am not very keen on the strong fruity smell. Whilst it is nice in a cleanser that is going to be washed off it doesn't work so well for me on a product that will remain on my face. Also, I really dislike how tight it leaves my skin feeling. I am well aware however that although these things bother me, they may not be such an issue for you. 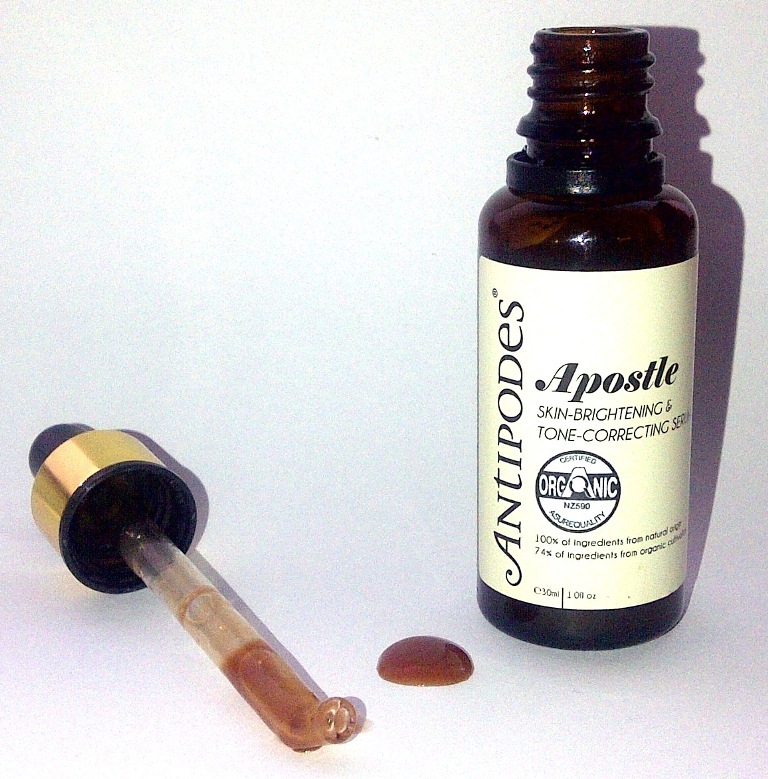 Antipodes Apostle Skin-Brightening & Tone-Correcting Serum costs £41.99 from various UK online stores.